Situated on the edge of the Yemenite Quarter is the Carmel Market. This packed daily market extends along the long, narrow HaCarmel Street (and neighboring lanes), which branches off Allenby Street at Magen David Circle. Despite the lack of traffic, it is noisy with stall-holders’ cries and busy with the extraordinary crush of people. Huge piles of fresh fruits, vegetables, olives, herbs, spices and meats are on sale for the lowest prices in the city. Stalls often specialize in just one item, offering only crates of nectarines, for example, or olives or oranges. 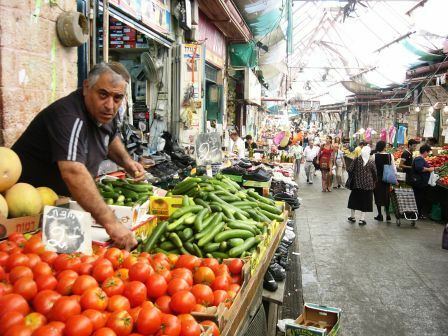 The market is a perfect location to observe the bringing together of East European shtetls (Jewish villages), the Jewish quarters of north Africa, the sophistication of Tel Aviv and the raucous energy of the sabras (Jews born in Israel), all of whom are pressed shoulder to shoulder here. The market is especially hectic and colorful on Fridays, as people shop for Shabbat. You can meander and explore your way through the Carmel Shuk Sunday through Thursday from 8am until the sun sets, and on Fridays from 8am to 2pm, Enter from the backside, off Hayarkon near Jaffa, or the more common entrance which can be found at the junction of Allenby Street and King George, Sheinkin. To the south of the Carmel Shuk entrance is Nahalat Binyamin, A more sedate artists and craft market featuring the local artistry of Tel Aviv. Where to eat? Make sure you don’t miss out on the places hiding in the alleys behind. “The best Borekas place in town”, many people would call this small Turkish Borekas booth, just in the entrance to the market, on your right. Borekas actually is originated in Bulgarian and Turkish cuisine, but Israel has claimed it to be its own. It is a salty pastry, usually puff pastry, filled with cheese, potato or spinach. Delicious when you eat it still warm from the heat of the oven. Here you will get it sliced up with a hardboiled egg, homemade pickles, tomatoes and a delicious spicy tomato paste. A little after the Turkish borekas, there are two excellent stalls offering griddle fried meats and sausages, Stuffed into a pita or baguette paired with Middle Eastern salads and sauce. The aromas coming from that grill are delicious. If you want sustenance that will last you all day try the delicious and authentic hummus at Hummus HaCarmel, in the centre of Shuk HaCarmel. A plate of freshly made chick pea paste with tahini and smothered in olive oil. Accompanied by pickles, chopped salad, a hardboiled egg and soft and fluffy pita bread, washed down by n ice cold bottle of black beer (non-alcoholic) is a must.